Make the most of the ready-made Christmas scenes. Colour in the fireplace setup, then simply matt onto layers of card for a cheery greeting. Take it one step further like Claire has by sweeping a little light green distress ink onto white card before adhering the scene in place – this creates a lovely glow. You can also enhance festive settings in other ways. Apply Glossy Accents for shine – check out our snowglobe design to see this at work – and adhere sequins for extra pizzazz. Claire is a big fan of inked backgrounds and watercolour washes, so why not follow her lead? To create a sky, paint pink and blue watercolours onto watercolour card, then splatter paint drops on top for texture. 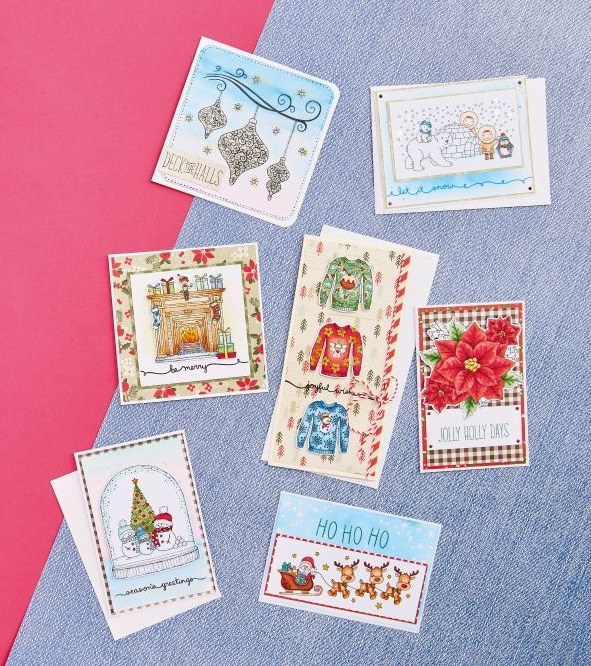 As well as scenes, this set of digi stamps also comes with some gorgeous motifs such as baubles, poinsettia and Christmas jumpers. Colour these in, matt onto patterned paper and ta-da! We love how Claire has pared back the ornate baubles; prepare a watercolour background, avoiding the baubles and leaving them white, before applying Glossy Accents. We’ve got even more free digi stamps for you to enjoy.